-Losing hair? (Isn't everyone?) Don't try to hide it. -Ask MeFi: What are the best cookbooks in regards to technique and theory? The steak is cut into 2" by 2" pieces, with 64 pieces cut total, half of them kissed by a frying pan and hence enhanced in color. The meat is then arranged on a 16" x 16" platform of clear acrylic and placed on top of a podium. On either side of the sculpture are LCD panels hung from the ceiling. Each panel plays a 20-minute loop of a butcher contemplating his next move. -Let's try some fashion blogging: OMG! Shoes!, outfits, t-shirts. Coming soon to a Haverchuk near you: the new Joy of Cooking! Yes! GG hopeful Helen Mirren is a leafy green vegetable that might kill you! Or so Variety might like you to think. This image came in an e-mail linking to their Globes preview. When I clicked on Helen's face it took me to an article with this headline: "How do marketers switch from selling tasty tentpoles to fiber-rich fall films?" 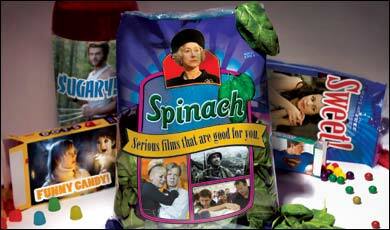 And a few paragraphs into the article: "In many ways, it's the difference between selling candy and spinach." Tentpoles might sell faster than deep-fried Oreos at the State Fair, depending on what they're dipped in, but I would say the distinction between summer and fall movies is more like the difference between Subway and Così. Both will fill your tummy but at Così you might encounter a few foreign words (does "gorgonzola" count as foreign?) and the clientele will be less likely to spill Sprite on the floor. Neither one is good or bad for you necessarily. Just like movies, food is essential for our survival. Even greasy meatball sandwiches are a suitable cure for hunger. I give Variety a B- for Photoshopping and a D for culinary metaphors. Better luck next time.